Iran’s chief negotiator says a nuclear deal with world powers is "doable", insists Iran would refuse to send out its nuclear stocks abroad. Iran’s chief negotiator with the West on Sunday said that a nuclear deal between his country and world powers is "doable", but ruled out the idea that Tehran would send out its nuclear stocks abroad. "Getting to an accord is doable. Solutions have been found for numerous questions. We are still working on two or three issues... The talks are in their final phase and are very difficult," Abbas Araqchi told reporters in Lausanne, according to the AFP news agency. "We are optimistic, the chances of getting a deal are there. But this requires the other side taking the necessary decisions and demonstrating their political will," he added. At the same time, Araqchi stressed, "The export of stocks of enriched uranium is not in our program and we do not intend sending them abroad.... There is no question of sending the stocks abroad." Araqchi also reiterated that Tehran wanted sanctions lifted under any accord "under a precise program". "All the sanctions have to be lifted -- those of the EU, the United States and the UN Security Council. There are six (UN Security Council) resolutions that have to be annulled," Araqchi said, according to AFP. Iran and the six world powers are trying to turn an interim agreement signed in 2013 into a permanent one. 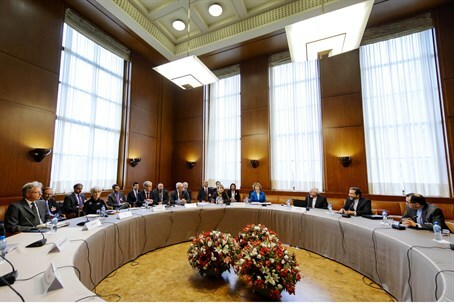 On Sunday reports emerged that a provisional agreement on key elements of Iran’s nuclear program had been reached. Western diplomats in talks in Switzerland said that Iran had "more or less" agreed to slash the number of its centrifuge machines “by more than two-thirds” and to ship abroad “most of its stockpile of nuclear material.” Iran denied, however, that an agreement had been reached. British Foreign Secretary Philip Hammond said hours later that he believed a nuclear deal with Iran could be reached, but insisted it must place an atomic bomb "beyond reach" for the Islamic Republic. "We are here because we believe a deal can be done," Hammond told reporters outside a Lausanne hotel as he became the last of the foreign ministers to arrive for talks with world powers. "It's in everyone's interests that a deal does get done. But it has to be a deal which puts the bomb beyond Iran's reach. There can't be any compromise about that," Hammond insisted. In a sign that a deal was nearing, Iranian President Hassan Rouhani last Thursday spoke with the leaders of Russia, France and Britain, and on Friday, Hammond said he was ready to join the talks and fly to Switzerland if there was an immediate prospect of progress. Iran has for years declared that it will never give up on its “right to enrich uranium” as part of a deal with the West, and lawmakers in the country recently passed a proposal stipulating that Iran will restart its uranium enrichment to the "level required by Iran's needs" if the sides fail to reach a deal.